Soon it is almost Christmas time again. What Christmas DVD movies you are seeking for watching at home together with your family? A Christmas Carol, a timeless classic Christmas movie attracts attentions from all corners. But not all of the review on this Disney movies seems to be positive. The cranky Scrooge looks horrible at first, so maybe your kids will be scared at the very beginning. But it really worth you to take a look. No matter you are buried with the pressure in the society, or one live in a terrible life, this file will let you pick up the strength and courage you ever had. To be frankly, this is a film that you are not going to get tired of. People watch it on Christmas holiday year after year. But are you fed up with finding the DVD disc (unknown scratched or not) from a mess of DVD collection? Provided you have ripped the movie to MP4, iPhone iPad Android, you will have no worry about this. But how? Ripping Disney DVD movies has becomed increasing difficult since they are encrypted with Disney X-project protection, which is an impenetrable barrier for common DVD ripper for Mac. Luckily, MacX DVD Ripper Pro would be a perfect solution to help Mac users out of this kind of problem. It is designed to rip DVD to MP4, MOV, FLV, MPEG, AVI, etc for playback on Mac, iPhone, iPad, iPod, PSP, QuickTime. More than that, it also enables you to make DVD backup to USB, hard drive, DVD with original quality in MKV, MPEG2, Video TS format which can be burned to DVD via Mac iDVD. With all copy protection supported, this Mac DVD ripper allows you to rip Disney DVD A Christmas Carol or any other Christmas Disney DVD movies for a backup in few minutes. BTW, its Windows version also works perfect for Windows users. Prior to rip the Christmas DVD movies, you should download the DVD ripper on your Mac (macOS Sierra/El Capitan included). If you are a windows user, try windows version: MacX DVD Ripper Pro for Windows. After free download and install MacX DVD Ripper Pro, you can load and import DVD movie from DVD driver by clicking "DVD Disc" or from DVD folder by clicking "DVD Folder". In the output format area, select the target format "to iPhone". Right click "RUN" to begin your DVD to iPod conversion. 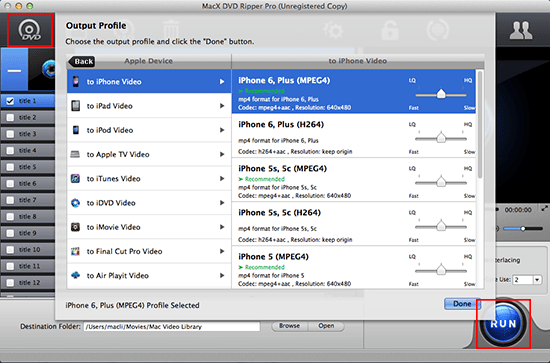 MacX DVD Ripper Pro will do the rest for you. After the ripping process is complete, upload the converted video into your iPhone through the sync of iTunes Library to enjoy your movie in your fashionable iPhone. Besides digitizing the movie, to copy DVD Mac is also a wide choice to prevent DVD discs from scratches so as to watch it year after year. To make a DVD copy of Disney A Christmas Carol, you should choose "Copy" and Select the output format as you need. Here are 4 mode for you to backup Disney movies in case of scratches. 1. To copy to MPEG, you will backup Current title to single MPEG-2 file with original Video, original 5.1-channel AC3/DTS Dolby audio and the mixed Subtitle for you to burn it to one DVD disc or store the DVD movie on USB Portable Storage Devices. 2. 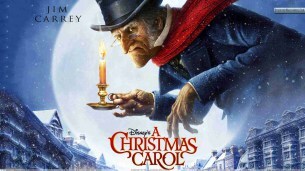 To backup Main Title, copy and save A Christmas Carol DVD with selected audio/video tracks as a single MPG video file. 3. To copy to MKV will hold all Video/Audio/Subtitle tracks and pass-through the current title to MKV file format. 4. 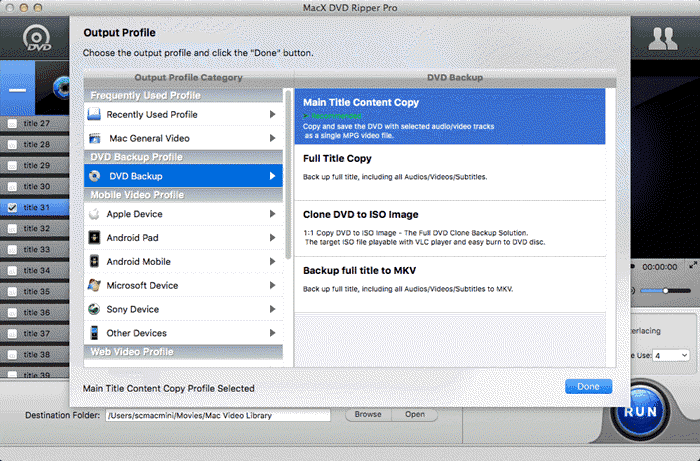 To choose Clone DVD to ISO image, MacX DVD Ripper Pro will acts as DVD Decrypter, decrypt full DVD disc and convert DVD to a VIDEO_TS folder, so that you can play it with VLC Player or burn to DVD disc use iDVD. Eager to download Christmas movies freely from YouTube for unlimitedly replay? This tutorial shows you the best way to free obtain Christmas movies downloads as well as easily enjoy YouTube top classic Christmas movies. This post centers on the list of the best Christian movies for you and your kids to enjoy this Christmas, as well as free solutions to copy and download the great movies in Christian tone for safe keeping and on-the-go enjoyment. MacX DVD Ripper Pro is a functional DVD ripping program with top quality and fast speed. With the aid of this feature-rich DVD converter, you can freely rip Christmas movies to mobile devices.